Many of us have heard the importance of getting adequate protein at each meal due its role in keeping us full, but for those who are vegan, vegetarian, or trying to minimize their carbon footprint, finding non-meat sources of protein can be challenging. The good news is you might be surprised to learn that vegetables can be a source of protein as long as you know which ones to choose and get adequate amounts. 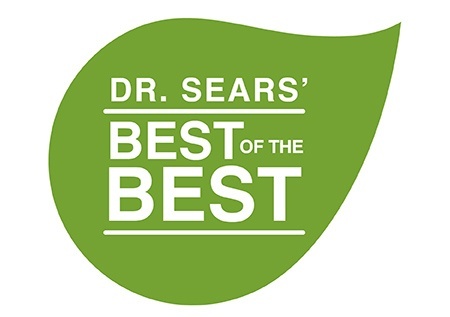 Here we’ll give you our top picks and which ones rank high on Dr. Sears’ approval list. 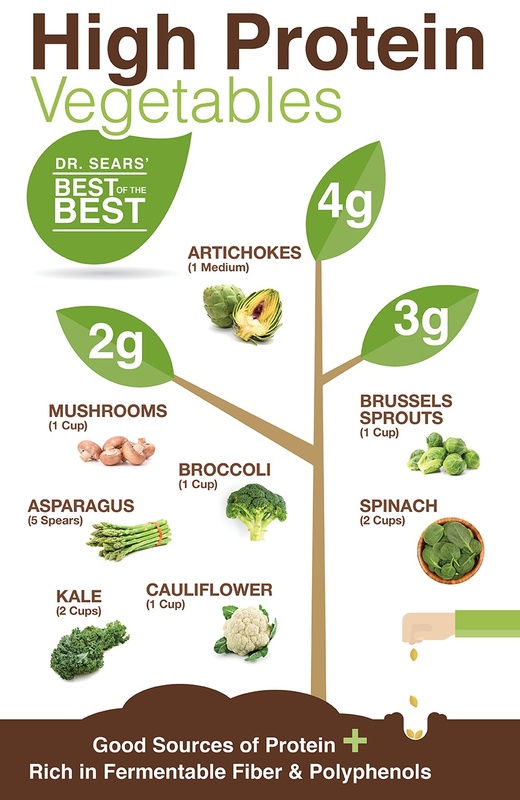 Dr. Sears Best of the Best: The following vegetables rank high in Dr. Sears’ opinion when following the Zone Diet. The reason for this is not only are they a good source of protein, but their ratio of protein to carbohydrate is high, ensuring that you maintain the ideal hormonal balance once consumed. Plus they are rich in fermentable fiber and polyphenols, making them a great addition to any PastaRx Fusilli or Orzo dish. Spinach: 2 cups of fresh spinach = 3 grams of protein. 3 grams of protein might not sound like a lot, but if you’ve ever cooked with spinach you know how quickly it wilts down to almost nothing. One 10oz package of baby spinach (probably shrinks to about 1+ cups once cooked) supplies 7 grams of protein not to mention being a powerhouse when it comes to our daily intakes of vitamins and minerals (e.g. supplying 1100% of the Daily Value of Vitamin K). Low levels of vitamin K in the blood have been linked to a higher risk of bone fractures, so this is a great way to boost your levels. In addition to Vitamin K, 10oz of spinach meets your entire daily intake for Vitamin A, 89% Vitamin C and is rich in Calcium, Iron, Magnesium and Manganese. Of course cooking or sautéing gives you the most bank for your buck nutritionally speaking based on how much you can consume, but even replacing iceberg or romaine with spinach in your salads can really elevate its nutritional profile. Mushrooms: 1 cup of mushrooms = 2 grams of protein and 15 calories. Don’t be fooled by the color of this veggie. Just because it’s white doesn’t mean its lacking nutrients. Where many fruits in vegetables are rich in vitamin A, C and Potassium, what makes mushrooms unique is they provide nutrients other fruits and veggies don’t typically offer. Mushrooms are a great source of vitamin D supplying 114% of our recommended daily intake in just one serving (great for those who avoid dairy!). They are also rich in Copper (40% DV), Selenium (34%), Zinc (7%) and a variety of B vitamins too. Sauté in a little olive oil, salt and pepper and you have a great addition to any meal! Asparagus: 5 spears = 2 grams of protein with 2 grams of fiber. 5 spears might not sound like much when it comes to asparagus, but even this small amount supplies 10% of the DV for Vitamin C along with small amounts of vitamin A, calcium and iron. Ever wonder why your urine is so fragrant after consuming asparagus? During digestion sulfurous amino acids in the vegetable are broken down resulting in its odor. Only 22-50% of the population can actually smell the pungent odor asparagus produces in the urine. Are you part of the lucky bunch? Kale: 2 cups= 2 grams protein. Kale definitely had its moment in the sun popping up in everything from shakes and smoothies to kale chips. Nutritionally speaking in addition to its fermentable fiber and polyphenol content, kale has a lot to offer so it’s worthy of its praise. Just 2 cups contains 13% of the DV for Vitamin A, 16% vitamin C, 71% vitamin K, 15% calcium, 20% Manganese, and 6% Potassium. Plus at 7% of the DV for fiber it helps keep you full and promotes good digestion too! Broccoli 1 cup= 2 grams protein. Broccoli is part of the cruciferous vegetable family, a group known for its cancer preventive properties. It’s naturally low in calories and sodium and a good source of fiber in addition to being rich in vitamins, minerals, and phytochemicals. For certain groups 1 cup of raw broccoli contains almost the full daily requirement for Vitamin C (90 % DV) and Vitamin K (77% DV) in addition to providing many other nutrients such as potassium, Vitamin A, and lutein which is great for eye health! Cauliflower: 1 cup= 2 grams protein. Another member of the cruciferous family cauliflower contains glucosinolates, sulfur-containing phytochemicals linked to their role in reducing the risk of certain types of cancer. Just 1 cup supplies 8% of the DV for fiber, 57% of the DV of Vitamin C, B Vitamins and lots of minerals too. Brussels sprouts: 1 cup= 3 grams protein. Brussel Sprouts may be the highest in this bunch for their fiber content per cup at 3 grams or 12% of the daily value. Also a member of the cruciferous family, Brussel sprouts contain alpha-lipoic acid which has been shown to be beneficial in individuals with diabetes to help lower glucose levels, improve insulin sensitivity and prevent oxidative stress. Plus it’s rich in B-vitamins and clocks in at 130% of vitamin K, 83% Vitamin C, along with many minerals too. Artichokes: 1 medium artichoke= 4 grams protein. It also contains 7 grams of fiber or 25% of our recommended intake. In addition to healthy digestion and keeping us fuller longer, dietary Fiber has been shown to help support healthy blood cholesterol levels, lower the risk of heart disease and help promote good bacteria in the gut. Artichokes are also high in folate, which is important for woman of child bearing age, along with being a good source of numerous vitamins and minerals. Don’t have the time to cook, try using artichoke hearts instead which are a great addition to any salad or pasta dish! Good Carbohydrates: These veggies get an OK rating by Dr. Sears’. They are slightly higher on the protein to net carbohydrate ratio so should be consumed in smaller amounts although excellent sources of fermentable fiber. Satisfactory Carbohydrates: The following list of vegetables and legumes meet Dr. Sears’s approval, but again caution should be taken since the protein to net carbohydrate content is a bit on the higher side. What is considered a serving of vegetables? When using vegetables with PastaRx, we use the same guidelines as the USDA for serving size. 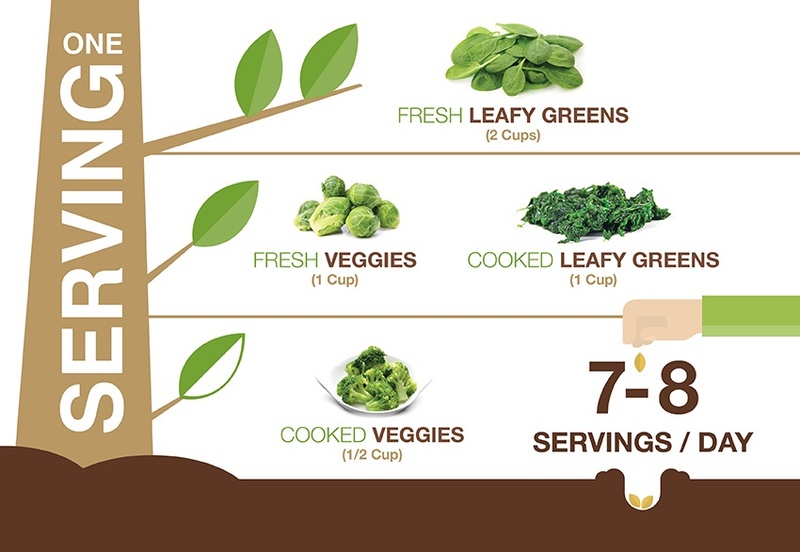 If you are eating fresh vegetables, a serving size is 1 cup (2 cups for leafy green vegetables). For cooked vegetables, a serving size is considered to be ½ a cup (1 cup for leafy green vegetables). For those who follow the Zone Diet and consume meat, poultry or fish, legumes would fall in the vegetable group, but we realize that for vegetarians, vegans, and individuals who rarely eat these foods, you may consider legumes as part of your protein requirements. In this case we would want to ensure you are consuming adequate amounts of vegetables in addition to this. We suggest aiming to have 3-4 vegetables servings at each meal when using PastaRx as your protein source. The goal being to have 7-8 servings of vegetables per day. If following the classic Zone Diet you can use the block guide to help determine your needs here. On the go? Click to download as PDF. 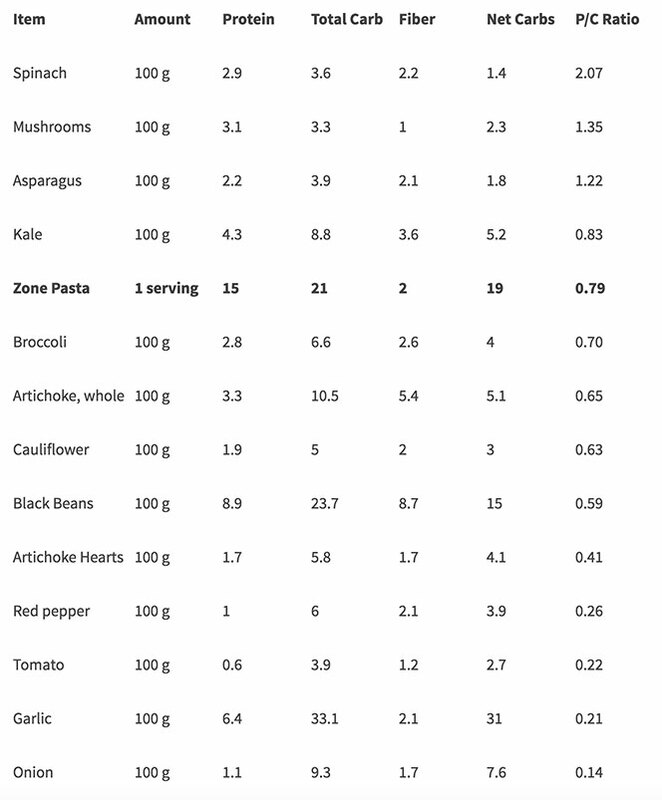 Below is a list of vegetables and legumes for adding to Zone PastaRx. Based on Dr. Sears' recommendations if the Protein/Net Carb ratio is greater than 0.79 it will help to enhance the hormonal response when using PastaRx as your protein source.